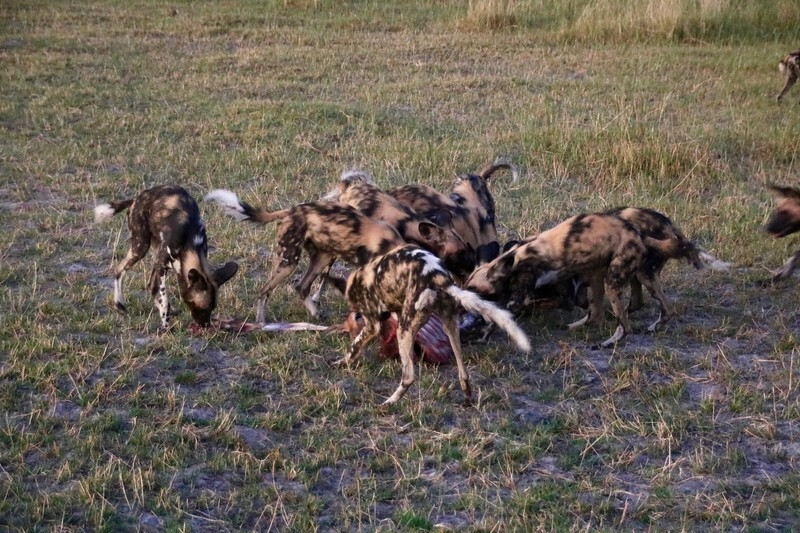 We bounced along the dirt “roads” of the Moremi Game Reserve trying to keep up with the pack of wild dogs. Royale Wilderness owner, safari guide and formula one fan Johnny Ramsden was in hot pursuit and in the back of the safari vehicle I would occasionally find myself airborne. We clung to cameras, thanked god for hats with tie strings that kept them from flying out of the vehicle and wondered once again whether seat belts might be, after all, a not entirely bad idea. Only a few minutes previously we had been sitting in our heavily modified Toyota Land Cruiser safari vehicle lazily watching a pack of around 35 African wild dogs as they stretched and woke from their naps. The heat of the day was gone and the pack was likely to go on one last hunt before dark. 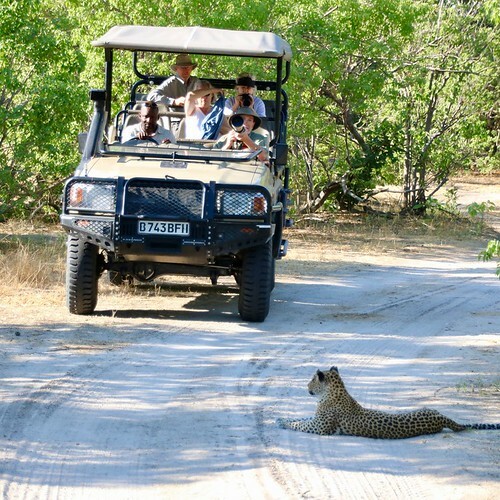 There was only one other vehicle around which belonged to a wildlife photographer from cheetahman.com. We had encountered Cheetahman earlier in the day and let him know about this pack. 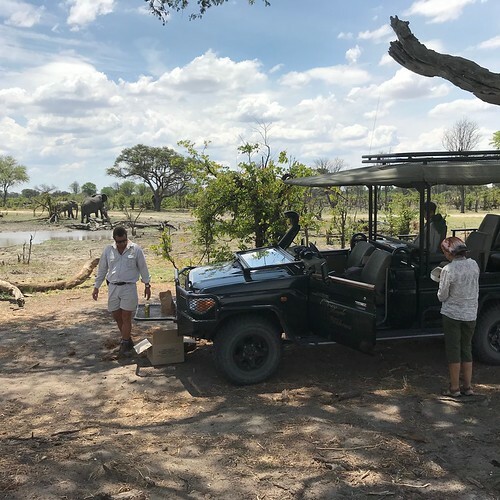 Safari guides routinely share information with other guides because the Moremi Game Reserve is a huge part of the Okavango Delta area (just under 5,000 square kilometres or 1,900 square miles) and finding a particular pride of lions, rhino or pack of wild dogs is not simple. 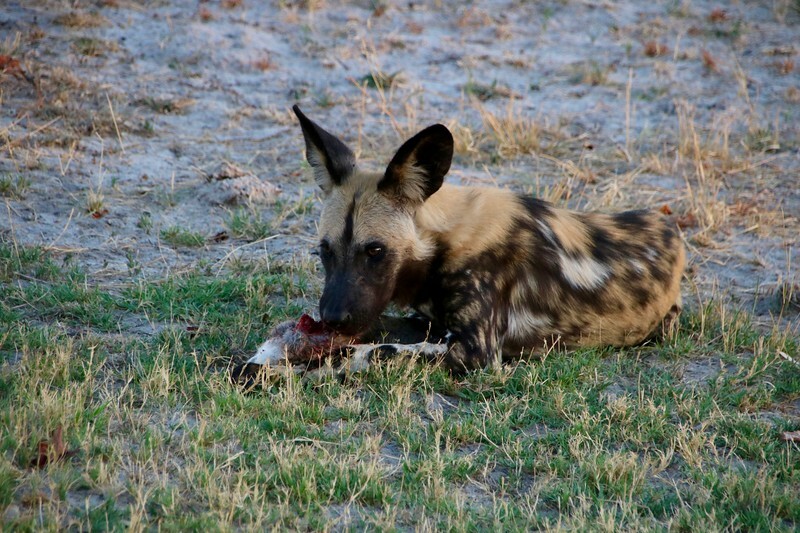 An African wild dog pack is the most effective predator in Africa. When the pack hunts, there is an 85% chance that some animal is going to find itself on the wrong end of the food chain. Even hunting as a pride, lions are only 30% effective by comparison. It is hard to picture these as killing machines when you watch them play like puppies and greet one another with their impossibly high pitched yelps that sound like someone is playing the video at the wrong speed or that the dogs have been breathing helium. While the pack was looking for larger prey like a juicy impala, an unfortunate scrub hare caught their attention and was quickly dispatched by a couple members of the pack. In the middle of the chase Cheetahman’s vehicle got stuck on one of the stream crossings and Johnny broke off the chase long enough to pull him out. You have to come to someone’s aid if they need it because there is no auto club to call nor even any cell phone service to call them with. Johnny carried a satellite phone and had a crew back at our campsite with a truck that could come to our aid if we got stuck (and did one night on our trip when we were tracking a pride of 7 lionesses) but a solo vehicle operator could be stuck until someone happens to come along… if someone happens to come along. Our Good Samaritan duties fulfilled, we were back on the chase and caught up with the pack just in time to see it corner a group of a dozen adult and 3 juvenile wildebeests. The wildebeests formed a circle around their young with their horns out to fend off the dogs. The dogs were trying to get the animals to panic and run but the wildebeests were having none of it. If the dogs kept this up, one of them was likely to become a casualty so they broke off and raced after a herd of impala. Impala are the fast food of Botswana, the 4th fastest animal on the planet. They can run around 90 km/h (56 mph) for short bursts, can make 9 m (10 yd) jumps and can quickly change course. A single impala can probably outrun a single wild dog… but this was a pack. We watched as the pack went after one impala that was fast enough to escape but the next impala was less lucky. We saw them start the chase, but by the time we cleared the next small hill a few seconds later the chase was done and the impala was being torn apart. 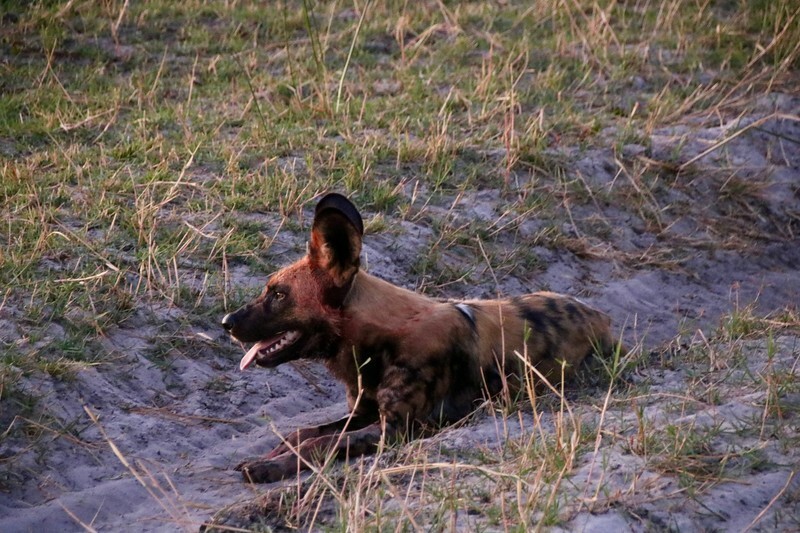 All thoughts of how cute a wild dog is are set aside when you see their blood cover muzzles tear into their prey. This is the time when Johnny says some tourists want to suddenly head back to camp. This is the part of the Circle of Life that they left out of the Lion King. 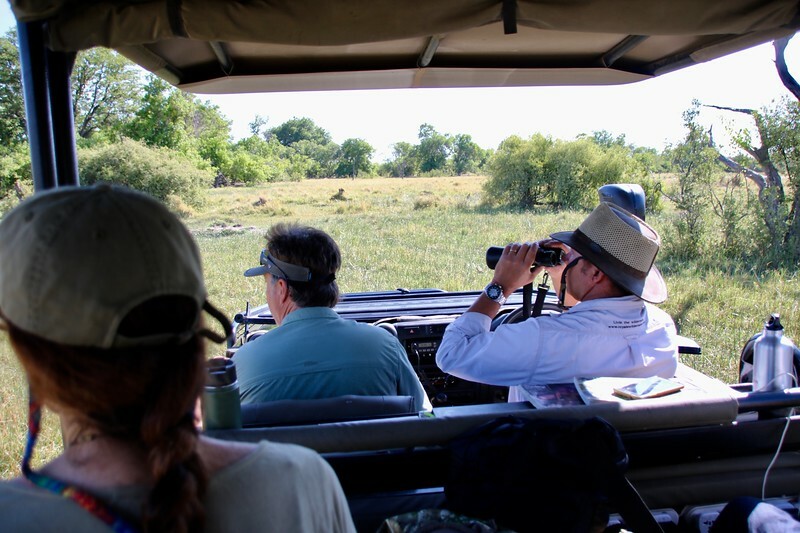 I was on this safari as a guest of Botswana Trek which which can find the right Botswana safari for you.